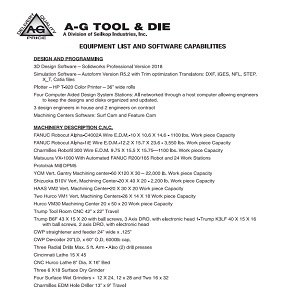 A-G Tool and Die, a division of Seilkop Industries, Inc., provides comprehensive development, design, and die fabrication services. Engineers work with customers at the outset of the product development phase, offering consultation and advanced process simulation to prevent hang-ups in the fabrication and testing phases. Our programmers have developed advanced simulation software packages to give detailed feedback about the manufacturability of a design. The software optimizes the blank, predicts stock widths, and verifies that the part can be produced to print. This means the design can be finalized before any machining labor is wasted on tooling that will not work. The transfer simulator can physically check dies’ clearance and pitch. The open design allows engineers to fine tune tooling prior to installation at the customer’s facility, saving time and money. These proactive simulation and testing methods add up to large labor savings, which means customers receive the best quality tooling at very competitive prices. Since multiple retooling steps to modify the design are eliminated, tooling projects are also completed on a much faster timeline than if the design and dies were produced by traditional trial and error methods. In-house testing capabilities include 200-350 ton tryout presses, automated machinery, and transfer machines. Our experienced designers and engineers can design dies with value added processes including tapping, fastening, clinching, sensing and protecting features. Today’s technology means we can have virtual meetings with customers around the world. This allows us to have a global customer base without unnecessary added travel expenses. Lean practices are incorporated into everything we do, ensuring our customers receive the absolute best value in progressive, forming, drawing, coining, and transfer die production. For more information about our progressive die design and fabrication capability, see the table below, or contact us directly.